so they support you to create the life, work, relationships you desire. The September Equinox offers you insight to illuminate where the imbalances currently exist in your life & how to reset yourself and refocus your life force. Especially the ways in which you are over giving and under receiving, the habits that may have worked in the summer but won’t support you now, and the ways in which making changes to your home, health and wealth can support you to end your year strong, sane and supported. 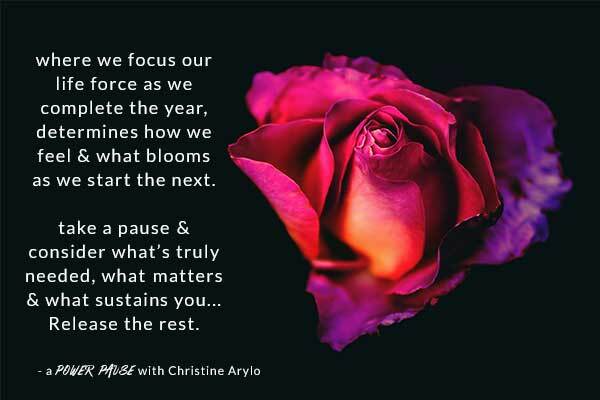 In this Feminine Power Time join women’s leadership and empowerment advisor and teacher, Christine Arylo, marries her MBA business background with 15+ years of wisdom and spiritual study in practical ways. shift sabotaging habits in small ways that make a big difference. Power Pauses are a form of feminine leadership which teaches us to work in harmony with the natural cycles of how the material and mystical world both work. Part of her Feminine Wisdom School, Arylo teaches how to use this ancient wisdom and way of working to apply to creating a life and work that creates an impact and is sustainable. Feminine Super Power Year opens again in November. Error: Error validating access token: Session has expired on Friday, 19-Apr-19 12:24:14 PDT. The current time is Thursday, 25-Apr-19 10:47:55 PDT.